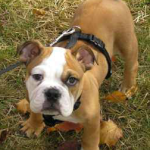 “We contacted Steve after we got our mini-bulldog. George was about 3 months old when we started training. 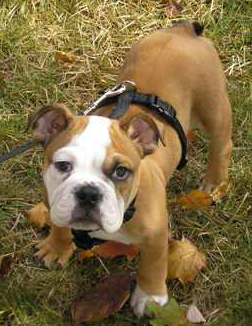 We contacted Steve because we wanted to start as early as possible with obedience training since we had read the bulldogs can become very stubborn and headstrong. As a puppy George had a habit of mouthing, jumping up, barking, all of the usual puppy behaviors. As George got older his main issue was mouthing/nipping when he was excited or was not getting his way. I had worked with a trainer in the past who was wonderful but only offered boarding training. We liked how Steve offered weekly in home training sessions with the option of boarding training if needed in the future. We felt we benefited from the weekly sessions because they taught us what our puppy needed and how to properly communicate with him. George responded quickly to his weekly/bi-weekly training sessions that we never needed to turn to the boarding program. We were concerned with how George would respond to the training knowing how stubborn bulldogs were known to be. There were days where he very difficult to work with on my own and he would challenge me when giving him commands. However, with practice and consistency George eventually gave in and stopped being so reluctant to work on his training. George has come a long way since we started training with Steve. His basic obedience is very strong and still improving daily. The remote collar was a great tool to help overcome George’s stubborn disposition. 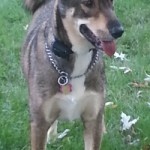 He is a confident, happy puppy now that he has structure and guidelines in place. The best thing we learned was to create a good balance between structure and affection, George was definitely an over-spoiled pup which started to cause him to think he was in charge. With Steve’s help, we added more structure and reduced George’s freedom to go where he pleased and his response was great. George now waits for a command and is looking to us for what he should do next instead of ignoring us and doing what he wants. Affection is now a reward for good behavior; he may even enjoy that more than his treats! We found Steve to be very fair. I never felt locked into a training session, it was always based on George’s needs and progress. If he felt George was doing well we would go an extra week between sessions. When we had to pause training due to a medical issue with George, Steve was understanding and concerned about George’s recovery always offering advice, tips and sending articles that would help him along. Training Story: George is a 12 week old Mini-Bulldog puppy, whose owner needed help with puppy training and dog training in Brewster NY. George’s dog training needs consisted of housebreaking, mouthing/biting, barking for attention, and teaching reliable obedience commands. We immediately began implementing my Housebreaking Protocol which was very effective in helping set both dog and owner up for housebreaking success. Mouthing/biting, barking for attention, and jumping are very frustrating behaviors for owners to deal with. These are undesired puppy behaviors that we do not want to become engrained and last into adolescent age. Here are a few very useful Puppy Training Tips that have helped many puppy owners succeed. George began my obedience training program which will help him to be reliable to his owner’s commands regardless of distractions. This makes life easier and less frustrating for owners, and helps the puppy feel secure in new and uncertain situations. Puppyhood is a great time to lay a proper foundation of structure, clear expectations, and obedience training that will last your puppy a lifetime. Whether you are looking for puppy training or dog training in Brewster NY, make sure you utilize a simple, safe, and effective dog training program. Luna’s owner contacted me for dog training in Brewster NY to help with unwanted behavior issues and off-leash obedience training. He wanted peace of mind in knowing that she will be off-leash reliable with obedience commands in her Brewster NY yard, at their summer home, and even at work. Jim wanted a polite and obedient dog who will listen, regardless of distractions, so he can bring her to his busy downtown office on a daily basis. 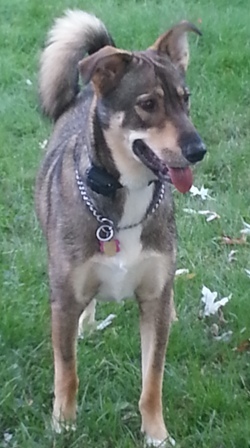 Luna had a tendency to ignore commands, jump on counters, and display other unwanted behaviors. With the right dog training system, we helped Luna become fully off-leash obedience trained and provided her owner the stress-free dog owning experience he wanted in just 5 training sessions. “Hi Steve, Luna is doing great. I have her out just with the collar and she listens great. She has gotten out of the house twice, but came right back with no collar on. I can’t thank you enough for all your help with her. It seems not long ago she was a handful. Now she is listening on and off the leash.